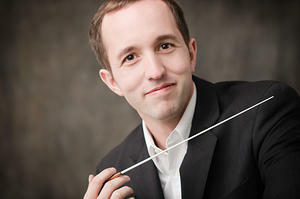 JUNE 28, 2016 | CHARLOTTE, NC – Christopher James Lees has been named Assistant Conductor of the Charlotte Symphony. His appointment begins September 1, 2016, as the Charlotte Symphony kicks off its 85th season. Lees also currently serves as Music Director of the symphony orchestra at the University of North Carolina School of the Arts in Winston-Salem. He will continue in that role during his tenure with the Charlotte Symphony. Lees will lead the Charlotte Symphony’s Lollipops family series beginning in the 2016-2017 season as well as select Pops performances. He will also conduct Charlotte Symphony education and community outreach concerts, including the annual Debbie Phillips education concerts for area middle school students, plus the Charlotte Symphony-Charlotte Ballet annual Nutcracker collaboration. A recipient of a Gustavo Dudamel Conducting Fellowship with the Los Angeles Philharmonic, Lees made his debut with that orchestra in April 2013. In the last three seasons, Lees has returned for performances with the Los Angeles Philharmonic, Detroit, Milwaukee, and North Carolina symphonies, and conducted debuts with the Houston, Indianapolis, Kansas City, Toledo, Flint, Winston-Salem, Kalamazoo, and New Bedford symphonies. Additional guest conducting engagements have taken him to Portland (Maine), the National Arts Centre Orchestra, Orchestre de Chambre de Paris, Aspen Philharmonic Orchestra, Cabrillo Festival Orchestra, the Music in the Mountains Festival, and Festival Internacional de Inverno de Campos do Jordão in Brazil. Lees has commissioned many new contemporary works and collaborated closely with Pulitzer Prize-winning composers including John Adams, William Bolcom, Joseph Schwantner, and Jennifer Higdon, among others. A native of Washington, D.C., Lees holds bachelors and master's degrees from the University of Michigan. His primary conducting mentors are Robert Spano and Larry Rachleff.